You know that book you purchase because a friend recommended it & then you happen to find it on clearance at an already marked down bookstore so you buy it insanely cheap? But then for whatever reason, it gets lost on your shelves, pushed to the far back, and never read? Well that is exactly what happened between The Boyfriend List and myself. It's a horrible way to start out a relationship with any book. After numerous affairs with other books on the shelf, I finally uncovered this little gem and decided to give it a go. Woah. Pass me the advil because I have developed a serious pain in my stomach from uncontrollable laughing of pure hysteria. Yes people, this book is that funny. Ruby Oliver is a fifteen year old girl who's got a tight nit of girl friends. Among the four of them, they have created a go-to book when it comes to boys and dating. Of course, this book has many revisions, seeing as though they began the book with hardly any experience to go by. 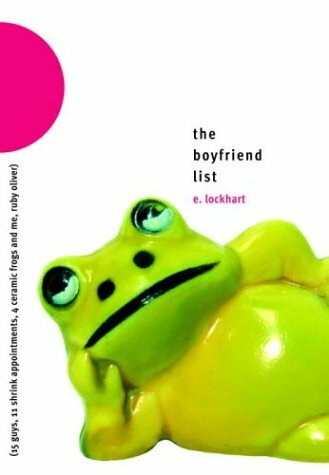 At the start of sophomore year the girls, including Ruby, find themselves in some what "serious" relationships with boys and decide to really put the book to good use. After several months of dating, whom Ruby feels is the one, the floor gets kicked out from under her. All in a matter of days her world is turned upside down. She's lost not one, but all her girl friends. And on top of that, the boy who she felt was the one, has now become the no one to her. Ruby finds her mental health in a state of crisis, and by the demands of her parents, she seeks help from a shrink. It is during these visits that she uncovers her past with boys and what it all means leading up to her recent disaster. Each chapter is titled a boy's name of who meant something to her at one time or another, in Ruby's past. It could have been her first kiss, the boy she secretly pined for but never knew she existed, or that fateful and maybe regretful relationship that brought everything to a head. Ruby's voice is comical in more ways than one. I was constantly laughing at her explanation of things. I felt that the teenage voice was spot on. All those conflicted, confused, misunderstood feelings were perfectly captured and projected from this hysterical teenage girl. Though the laughs kept coming, it was the softer moments that really stood out to me as well. I felt compassion for Ruby, to be that fifteen year old girl again, and never understanding why boys act the way they do - and how detrimental it can be when you lose a friendship that was once the other half of you. When I first purchased this book, I had no idea it was a series. Now that I have become aware of this knowledge I am plowing my way through these books. I can't get enough of Ruby. She makes me laugh. She makes me cry. The relationships she has with people are so identifiable. I knew that boy in high school, I remember that girl as well. It's a story that I feel any age can relate to. If you're in need of a book to make you laugh until your stomach is full of cramps - then I HIGHLY recommend this series. It's definitely going to be marked as one of those "why hadn't I read this sooner?" books! Sounds good. It reminded of a special boy that went by Rootbeer that wrote a book about picking up girls. I've never heard of these. I like that the description was in a list. It was cute. I will admit that I was a little turned off because those events don't seem serious enough for a shrink. BUT ignoring that little thought...it sounds funny. Ruby suffers from severe panic attacks - that is her reasoning for seeing the shrink. Which in my opinion, is a very serious issue. I've had this book on my shelf for awhile but haven't gotten around to reading it because I'm always tempted by all the pretty new book releases! Thanks for your review of this older title... I'm going to have to move it higher up in my TBR pile. this series is so good! i think the later books in the series are even better. I've heard that I'm going to totally love this series. I too have kinda forgotten about it and your review is making me want to bump it up on my list! Nice review! Your review made me but this book on my to read list. Thanks! Sounds really great. I was wondering what these books were all about when i saw them on your IMM and that you were reading them. They sound great. I could use a good laugh. Def adding it to my goodreads. Omg this sounds like it'd be such a fun book to read!! i'm so glad you're reading these! i've read the first one (and loved it, obvs) and the rest of the series sounds great. i love the voice of Ruby and yeah, the book is HIGH comedy. I loved this series so much. I'm glad you picked it up and are enjoying it. I LOVE stomach-cramp inducing funny books! WOOT. Anyway, I love your review!! !